This artist’s impression shows the pair of brown dwarfs named CFBDSIR 1458+10. Observations with ESO’s Very Large Telescope and two other telescopes have shown that this pair is the coolest pair of brown dwarfs found so far. The two components are both about the same size as the planet Jupiter. Astronomers have detected a new candidate for the coldest known star – one whose temperature is roughly equivalent to a fresh cup of tea. The object is part of a double system and is a type of star known as a brown dwarf, which is essentially a failed star. Brown dwarfs lack enough mass for gravity to trigger the nuclear reactions that make stars shine, but they’re more massive than what’s typically considered to be a planet. This newly discovered brown dwarf is identified as CFBDSIR 1458+10B, and is the dimmer member of the binary brown dwarf system, which is located only 75 light-years from Earth. This image of the brown dwarf binary CFBDSIR 1458+10 was obtained using the Laser Guide Star (LGS) Adaptive Optics system on the Keck II Telescope in Hawaii.This is the coolest pair of brown dwarfs found so far—the colder and dimmer of the two components is a candidate for the brown dwarf with the lowest temperature ever found. In fact, CFBDSIR 1458+10 is the coolest brown dwarf binary system found to date, astronomers said. "We were very excited to see that this object had such a low temperature, but we couldn't have guessed that it would turn out to be a double system and have an even more interesting, even colder component," said Philippe Delorme of the French National Center for Scientific Research and the Joseph Fourier University in Grenoble, France. Delorme is the co-author of a paper on the brown dwarf finding that will appear in an upcoming issue of the Astrophysical Journal. 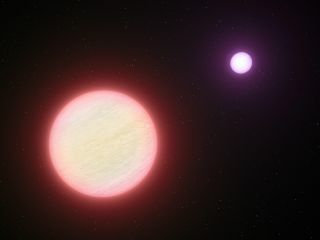 The dimmer of the two failed stars has been found to have a temperature of approximately 212 degrees Fahrenheit (100 degrees Celsius), which is the boiling point of water and not much different from the temperature inside a sauna. Our sun, in comparison, averages a temperature of about 10,000 degrees Fahrenheit (5,500 degrees Celsius), researchers have said. "At such temperatures we expect the brown dwarf to have properties that are different from previously known brown dwarfs and much closer to those of giant exoplanets – it could even have water clouds in its atmosphere," said Michael Liu of the University of Hawaii's Institute for Astronomy, who is the lead author of the study. "In fact, once we start taking images of gas-giant planets around sun-like stars in the near future, I expect that many of them will look like CFBDSIR 1458+10B." The hunt for cool objects in the cosmos is an active field of astronomy. NASA's Spitzer Space Telescope recently identified two other very faint objects as other possible contenders for the coldest known brown dwarfs, but the temperatures of these stars have not been measured as precisely. The brown dwarfs seen by the Spitzer Space Telescope have temperatures that range from 350 to 620 degrees Fahrenheit (177 to 327 degrees Celsius). Future observations will better determine how the objects found by Spitzer compare to CFBDSIR 1458+10B. Liu and his colleagues are planning to observe this newly detected brown dwarf again to better determine its properties, and to begin mapping the binary's orbit, which, after about a decade of observation, should allow astronomers to determine the system's mass.